Join Raven (booth 609) at GEO 19 Conference in Houston, Feb 10-13 | Register to Win DeWalt® Worksite Radio! Visit Raven in booth #609 at the Geosynthetics Conference — February 10-13, 2019. 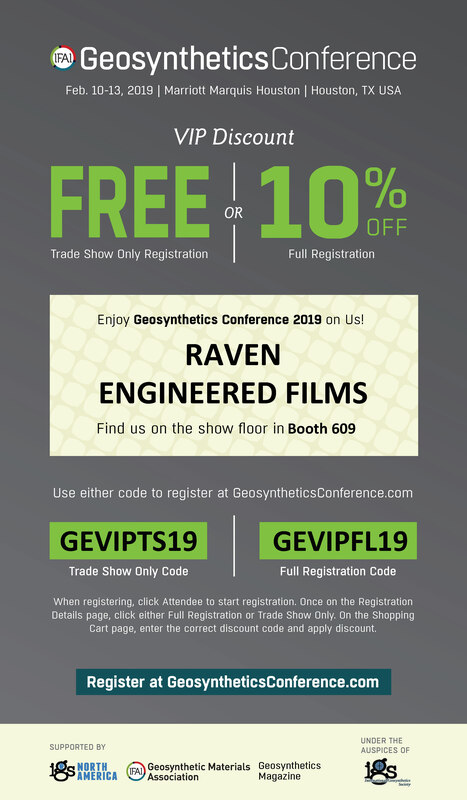 If you are attending the Geo 19 conference get your free Raven show VIP Discount Pass here, and be sure to stop by the our booth #609 to check out the latest technology in advanced geomembranes. We are a vertically-integrated manufacturer of targeted geosynthetics for containment solutions in critical environmental sectors and infrastructure. We manufacture high-performance geomembranes, and provide custom design-build, and certified installation services. At the booth, we are featuring our proven Dura♦Skrim® N-Series reinforced geomembranes, advanced Absolute Barrier® membranes for hazardous containment, and our popular HydraFlex® flexible containment series. The full Raven product line includes a wide-range of geomembranes including RPE, RPP, PVC, EPDM, CSPE, HDPE, LLDPE, fPP, along with all the supportive geosynthetic materials to complete your project successfully. TECHNICAL PAPER: Don't miss the Geo Conference technical sessions, we are presenting a paper titled, “Advanced Geomembrane Technology for Enhanced Protection of EPS Geofoam in Transportation Systems”, with some solid results on geomembrane performance in relation to the protection of EPS Geofoam and direct contact with gasoline. Be sure to attend on Monday, February 11, at 2:00 PM to learn complete details. Raven Engineered Films is an experienced manufacturer of advanced multi-layer geomembranes for the containment and control of liquids, solids, odors and hazardous gasses. Raven CLI Construction integrates a modular construction approach into project design and installation through large prefabricated geomembrane panels up to be further fabricated onsite. Factory panels are custom fabricated and mapped to exact specifications, eliminating up to 80% of field seams and significantly reducing labor, testing, and days required on site. We are looking forward to the show and hope you will take the time to stop by and visit with our knowledgeable geo staff to learn how we can optimize your next project. Also, be sure to drop your card and sign up for our DEWALT® 18V Worksite Radio/Charger give-away at the booth, winner will be drawn the last day of the show! DURA♦SKRIM® N-Series flexible reinforced polyethylene and polypropylene geomembranes are uniquely designed to provide unmatched performance and durability for your most challenging projects. Rugged N-Series products are reinforced with a closely knit 9x9 polyester 1000 denier scrim for exceptional toughness, and high tensile and puncture strengths. A highly stabilized formulation consisting of antioxidants, UV stabilizers and carbon black provide excellent protection for long-term exposed applications. The N-Series product lines are available in smooth or textured membranes and feature Raven exclusive GeoGrip™ or SureGrip™ surface textures to provide uniform stabilization and an increased friction between various soil and geosynthetic layers as well as work site safety. Large one-piece custom liners up to 8,000 lbs. DURA♦SKRIM® N-Series products meet select GRI-GM standard specifications for physical properties as outlined by the Geo Institute and are certified under the NSF/ANSI Standard 61, Drinking Water System Components – Health Effects. ABSOLUTE BARRIER® geomembrane liners and covers provide superior containment performance to sustain and protect natural resources. Absolute Barrier® is designed with an advanced barrier layer to mitigate odor emissions, and hazardous contaminants in solid, liquid, and gas form including methane, gasoline, benzene, and a wide multitude of other harmful VOCs including TCE and PCE. Available in 30 to 80 mil thickness with a smooth or textured surface. HYDRAFLEX® unsupported flexible geomembranes are designed to provide effective containment solutions for municipal and the environmental sectors. HydraFlex™ Containment Solutions include several targeted geomembranes designed for specific project attributes. All HydraFlex™ products are available in master rolls or large prefabricated one-piece panels, manufactured in a factory-controlled environment up to 8,000 lbs. per roll (up to 4 acres depending on thickness). The HydraFlex™ Series has a wide sealing-window for ease of field installation. Raven Engineered Films is an innovative 60-year manufacturer of advanced geomembrane liners and covers. From super-stabilized GRI-GM geomembranes to critical NSF certifications, we have an extensive product line to meet your specific requirements. Raven operational facilities include seven convenient locations with the latest state-of-the-art equipment, including blown/cast film and sheeting, lamination/coating, conversion capabilities in addition to a GAI-LAP accredited testing and development facility. Raven products are produced under our ISO 9001 certified management system.